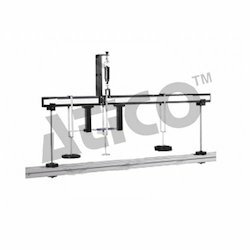 Offering you a complete choice of products which include shear force apparatus. A length of material supported horizontally and carrying vertical loads is called a beam. The loading causes bending and transverse shearing. The loads and reactions are the 'external' forces acting on the beam. They must be in equilibrium. However, the strength of the beam depends on 'internal' forces. This experiment demonstrates the nature of these internal forces and their dependence on the external system of forces. The experimental beam is in two parts, joined by a pair of ball bearing rollers running in flat vertical tracks. To develop the internal beam forces at the section an under slung tension spring is used to resist the bending moment, while an overhung spring balance provides the vertical shearing force. When load is applied to the beams, the under slung spring is adjusted to bring the beam back to a horizontal resting position. The vertical spring balance is also adjusted to ensure the top surfaces of each beam are at the same level. The shear force can then be directly read from the spring balance. Due to the mechanical arrangement, there must always be a net downward load on the longer side of the split beam. The beam is simply supported on end bearings and several weight hangers can be attached at any position on either side of the joint. A hinged metal strip is optionally available to simulate the loading pattern of a panelled girder for a more advanced experiment on influence lines. Demonstration of the action of shear in a beam; measurement of shear force at a section of a loaded beam; verify equilibrium of vertical forces. The bench mounted apparatus consists of a 'shear beam', 2 supports and 3 load hangers. The load hangers mountable in virtually any position along the beam. The 'shear beam' of two parts, joined at a low friction joint. Internal forces created, and bending moment resisted by an under slung adjustable tension spring: an overhung spring balance provides the vertical shearing force. Looking for E.N.T. Equipment ?